Manchester City manager Pep Guardiola led tens of thousands of demonstrators at a rally in the city in support of the bid for the Catalonia independence referendum. The revered former manager of Barcelona's football club told the gathered crowd he would be voting for independence on October 1 'even if the Spanish state doesn't want it'. Carles Puigdemont, leader of Catalonia's regional government, defied Madrid on Friday by setting a date for a binding vote even though the referendum has been ruled illegal by Spain's Constitutional Court. 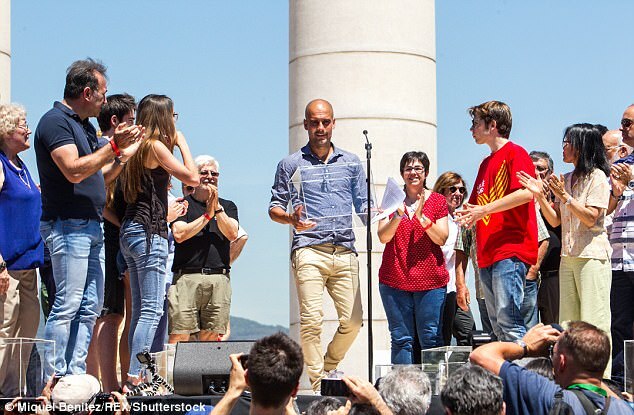 Guardiola said: 'We will vote, even if the Spanish state doesn't want it,' Guardiola told the crowd speaking in Catalan, Spanish and English. 'There is no other way -the only possible response is to vote,' he added. As Puigdemont looked on, Guardiola also spoke calling for the international community's support against 'the abuses of an authoritarian state'. While Barcelona authorities estimated the turnout at around 30,000 people, a separatist source put the figure at 47,000. 'I think independence is the only solution,' Ramon Fon, a retired 67-year-old at the rally, said. 'I want the referendum as a first step, and if the majority shares my opinion, then to win independence,' he said with the starred flag of Catalonia draped across his shoulders. The latest regional government poll found that 73 percent of Catalans were in favour of holding a referendum similar to the one held by Scotland in 2014 - though that one had the approval of the British government. But the same poll found that 48.5 percent of respondents opposed independence, with 44.3 percent in favour. In 2014, Catalonia held a non-binding vote in which more than 80 percent of those who cast a ballot chose independence, though just 2.3 million out of 6.3 million eligible voters took part. But the Spanish government of Prime Minister Mariano Rajoy has vowed to be just as tough this time around as it was in the 2014 vote called by Catalonia's regional president at the time, Arturo Mas, despite it being outlawed by the Constitutional Court. Mas was later put on trial and banned from holding office for two years. In February, the Constitutional Court ruled against the latest planned referendum and warned Catalan leaders they would face repercussions if they continued with their project. Spain has a variety of measures available to halt Catalonia's vote, including suspending Puigdemont for disobedience and even taking control of the regional government. In a bid to circumvent such action, the regional government has drafted a law seeking to extract Catalonia from Spain's legal system. It is expected to present the bill in the next few weeks to the regional parliament, where pro-independence lawmakers have an absolute majority. But this too will probably be suspended by the Constitutional Court. The proposal for the wealthy region to become a breakaway republic sets the stage for months of confrontation with the central government which says such a vote is illegal and must not take place. Previous secessionist challenges in Catalonia, a populous wealthy region whose capital is Barcelona and which has its own language, were blocked by Spain's conservative government and the Constitutional Court. 'The question will be: 'Do you want Catalonia to become an independent state in the form of a republic', Carles Puigdemont, president of the government of Catalonia, said. He said attempts to agree a date and the wording of the question with the Madrid government, which is vehemently opposed to allowing Catalonia to split from Spain, failed and left him with no other choice than moving unilaterally. 'We have always made very diverse offers and all of them have been rejected without any exception,' Puigdemont said. Pro-independence campaigners staged a symbolic ballot, organised by volunteers rather than government officials to get around court restrictions, in 2014, months after Scots voted to stay in the United Kingdom. Some two million people voted in favour of secession in that non-binding ballot, though turnaround was relatively low. It is not clear how far the legal wrangling may go this time as the Catalan regional government has said it would throw all its weight behind the vote. Under Article 155 of Spain's constitution, Madrid has the power to intervene directly in the running of Catalonia's regional government, forcing it to drop the vote. This could involve sending in the police or suspending the regional government's authority to rule. 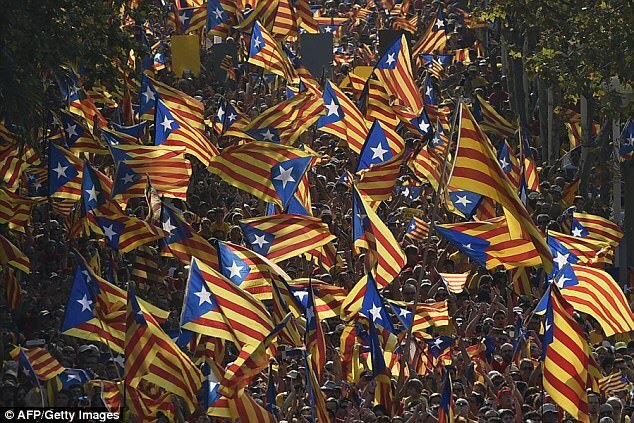 This is widely seen as a last resort move, however, and many analysts believe the clash will instead culminate in regional elections in Catalonia.